Rick Yancey’s first gothic suspense tale, The Monstrumologist, earned him a prestigious Michael L. Printz Award. The second installment of this acclaimed series, Curse of the Wendigo, finds young Will Henry on the hunt for a supernatural beast plaguing New England in the late 1800s. Will and his mentor, the domineering Dr. Warthrop, are enlisted to help the doctor’s former fiancée. It seems her husband has been lost in the Canadian wilderness. And to make matters worse, there are reports that a Wendigo – a creature who gorges on human flesh – is on the loose. Just a note though – while I think Curse of the Wendigo is an EXCELLENT sequel (serving up new monsters with a great heaping side of blood and gore, plus trips to the Canadian wilderness and 1800 Victorian New York) and I’d highly recommend it to any “mature” literary horror fan, I really don’t think it should be marketed to young readers. Yes, the hero in the book is a 12-year-old orphan, but the situations he and his guardian Dr. Warthrop find themselves in are truly horrifying. Stomach churning-, nightmare inducing- horrifying. Maybe the problem is that Rick Yancey is such an amazing writer – the setting, the rich (aka gruesome) imagery, the atmosphere, the dialogue, the characters all felt very intense and real. If this book were a movie, I’d be watching it through my fingers – wincing at certain scenes (i.e. the autopsy scene!) while scared out of my mind (but loving every minute, mind you.) It’s very graphic & violent (in a literary Dickensian way), and terrible things happen to a lot of innocent people, and no wonder young Will was a traumatized mess in the end! Once I’ve recovered, Book #3 The Isle of Blood next! 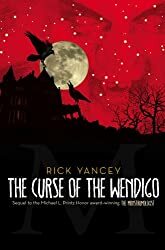 Curse of the Wendigo by Rick Yancey (Simon & Schuster Books for Young Readers) is available on Amazon, B&N Nook, Kobo books and iTunes iBooks. (Audio) Queen + Adam Lambert (ft. Nate Ruess) on 2013 iHeartRadio Music Festival (Amazon Local) Free Voucher to Purchase up to 40 Select Kindle eBooks for $1 Each!